It shows the information about the various query(s) executed (e.g. number of row(s) returned/ updated / modified etc.) All those data are as they are returned in the 'status message' sent by the MySQL server after (successful or unsuccessful) execution of the query, but before transmission of data has started. 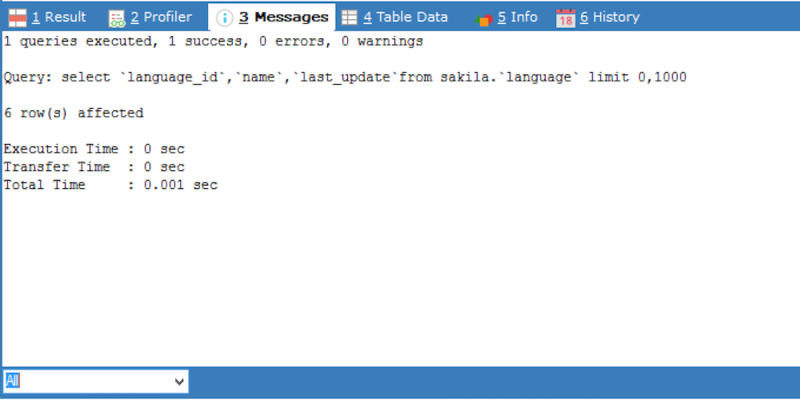 The 'time taken' shown here is the time that has passed from the above-mentioned status message was received till all data was transferred and received by SQLyog (a hint: to see the time passed from the query was sent to the server till is displayed in the HISTORY tab. This time is - with a reasonable fast connection - very close to the server execution time).